Horsepower-obsessed SLP engineers have made an unholy pact with Chevrolet to concoct a witch's brew of Camaro performance that only 100 fortunate souls will be privileged to own. The revered Corvette LT4 engine, the finest ingredients from SLP Engineering parts bins, and the street-proven SS moniker have been stirred in a bubbling caldron to produce a special anniversary edition that should capture the interest of enthusiasts for generations. Power and prestige for these extreme street-dominating Camaros come from replacing the standard muscular LT1 V-8 engine with even more firepower: the C4 Corvette's LT4. While official output figures rate the Camaro-fitted engine at 330 horses, that figure likely is conservative for the balanced-and-blueprinted powerplant, even before factoring in the forced-air induction system, ported exhaust manifolds, and the free-flowing stainless steel exhaust system. The SS LT4 features the full round of go-fast equipment available on the milder SS, plus a few spellbinding original pieces. The most notable change on all '97 SS models is the softened suspension, addressing the coccyx-bruising tautness of previous models. The SS LT4 further benefits from the revised Level II suspension package featuring specially tuned Bilstein shocks, progressive-rate springs, and revised rear lower control arms. Despite a reasonably compliant ride around town, this ferocious F-body produces a denture-dislodging 0.92 g on the skidpad. Nonetheless, the 65.8-mph slalom time revealed a handling trade-off that sacrificed 0.8 mph from the performance of the last SS we tested. With 330-plus horsepower on tap, a high-rpm clutch drop produces a volcanic plume of tire smoke and yards of granulated asphalt. Manhandling the leather-wrapped Hurst shifter through the gears with copious amounts of carefully modulated throttle netted a blistering 13.2 seconds at 108.8 mph. The SS LT4's 4.9-second 0-60-mph time trounces both the Z28 SS' 5.3-second run and the Mustang Cobra's 5.5-second best. 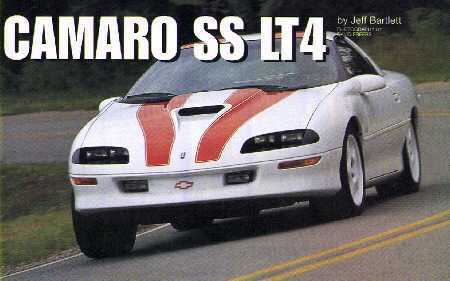 Yes, the SS LT4 can rightfully lay claim to being the reigning ponycar champ.